John Manning, a reporter for the Ballarat Times was involved in the establishment of the Eureka Stockade. He was a member of the Ballarat Reform League, and was in the Stockade when it was stormed. His vivid written eyewitness account makes him Australia's first war correspondent. Manning was one of the thirteen men charged with High Treason who were acquitted by Melbourne juries in 1855 after a vigorous campaign for their release, spearheaded by Melbourne's newspapers. The colony was considered sufficiently quiet and composed as to be able to dispense with the services of the three companies of the 99th Regt., which have been at Melbourne since the Ballarat disturbances, and they had consequently been sent back to Hobart Town in the City of Hobart Steamer, which was chartered for the purpose at an expense of £900. Col. Reeves had left for England in the James Baines on leave of absence. 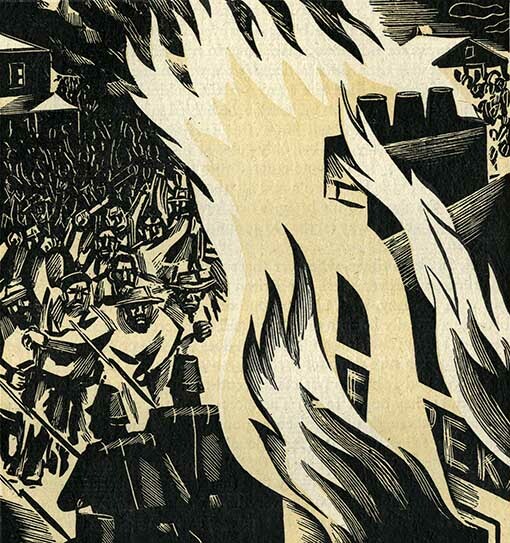 The whole story of the Ballarat riots must be ere this familiar to the British public. It will be remembered that out of the 125 prisoners made at the Eureka Stockade, thirteen were retained for trial, on the capital charge of high treason. They were brought to trial early in January, but from some official neglect on the part of the Attorney General, W. Foster Stawell (cousin of the discarded Colonial Secretary) the prisoners had not been furnished with c0pies of the indictment. Again the trials were fixed for 5th February, but the Attorney General, for some unexplained reason, caused their postponement in- definitely. Hopes were entertained that this postponement implied an abandonment of the prosecution on the part of the crown. It was known that the commission appointed to inquire into the administration of the law on the gold fields, and to ascertain what reality there was in certain grievances complained of, had recommended the granting of an amnesty to all the rioters. Tile Government, however, finally determined on bringing all the prisoners to trial, on a charge of high treason. On the 22nd February the court opened, presided over by His Honor Sir William a'Beckett, the Chief Justice. 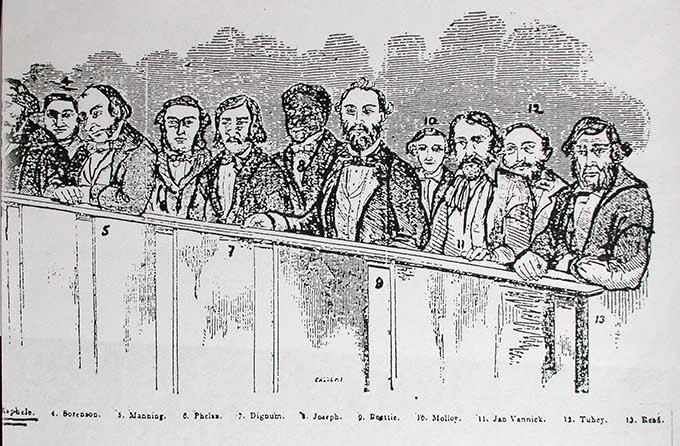 The thirteen prisoners were placed in the dock. Their names were- Timothy Hayes, Charles Raphelo, John Manning, John Joseph, J. Vennick, James Beattie, Henry Reed, Michael Tuohy, James Macfie Campbell, William Molloy, Jacob Sorenson, Thomas Dignam, and John Phelan. The right of challenging jurymen being claimed by each prisoner, necessitated their being tried separately. Hayes and Raphelo were remanded on affidavit of absence of material witnesses. Manning was also remanded on account of absence, from illness, of counsel. John Joseph, a man of color, being next on the list was then placed in the dock. One hundred and eighty jurors had been summoned, and both the Attorney General and the prisoner exercised freely their right of challenge, which process took up nearly an hour before they were finally empanelled. The routine of scanning the physiognomy and person of each juryman prior to challenge or admission, was gone through amidst the most uprorious laughter, in which His Honor the Chief Justice joined. Joseph's trial occupied two days ; the clearest evidence was given of his having been found armed within the insurgent's stockade ; he was identified as having been seen drilling and generally acting with the insurgents at all their meetings. These facts were distinctly proved by the evidence of sundry troopers, who had been sent in different disguises to the various gatherings of the disaffected, and confirmed by the evidence of several soldiers and others of the attacking party ; one soldier went so far to say that to the beat of his observation it was the prisoner Joseph who fired, the bullet by which Captain Wise was fatally wounded. It is currently believed that the evidence of the Crown witnesses contained many inaccuracies and exaggerations, as indeed might have been expected both from those who had mixed with the insurgents as spies, and others who, as having formed part of the military force by which the stockade was stormed and taken, could scarcely be considered sufficiently disinterested to give impartial evidence. But as already stated, the main charges against Joseph were substantially proved. The jury evidently considered that it lay with them to declare the commission of such acts by the prisoner amounted to high treason; they, by returning a verdict of Not Guilty, recorded their opinion that the accused, although guilty of arming himself against the authorities on the gold fields, was not guilty of high treason. Joseph's trial occupied two days. The next prisoner on the list, John Manning, was brought to trial on the 26th Feb, and the evidence in his case was similar to that given at Joseph's trial. Manning had previously to the outbreak been employed as reporter for the Ballarat Times, and had at the trial of the editor of that journal for addition, declared by affidavit that he was the author of certain articles for which the editor and proprietor was prosecuted for sedition, and found guilty. As in Joseph's case, his evidence of Manning, having attended meetings of the disaffected was quite clear, as the fact of him having been one of the defenders of the stockade. The Jury, however, returned a verdict of not guilty. There yet remained eleven prisoners in custody on the same charge. On the day following the acquittal of Manning the Attorney General applied for a remand until next Criminal Sessions. The Attorney General disclaimed any reflection upon the propriety of the verdicts given he intimated that his own opinion was very different from the conclusion come to by the jury, and hinted that he had no confidence in the present panel, and felt it to be his duty from the nature of the offence charged to proceedings with the remaining prisoners. John Manning was the second of the thirteen tried for High Treason to face the courts. The owner and editor of the Ballarat Times Henry Seekamp had been found guilty of sedition and jailed for three months a few months earlier. It was common knowledge among the miners and authorities that John Manning had penned many of the seditious articles that Seekamp was found guilty of writing and the authorities expected that he would be convicted by a jury which was chosen from the same jury pool that acquitted John Joseph. Once again the jury did not have any Irish representatives on it, nine of the jurors were working men. The only problem with John Manning's case was that the Crown had very little evidence that he had actively participated in the Eureka Stockade. It took the jury only a few minutes to find him not guilty of the charge of High Treason. Manning's acquittal was a blow to the prosecution's chances of recording a conviction because Manning was regarded as one of the leaders of the rebellion. 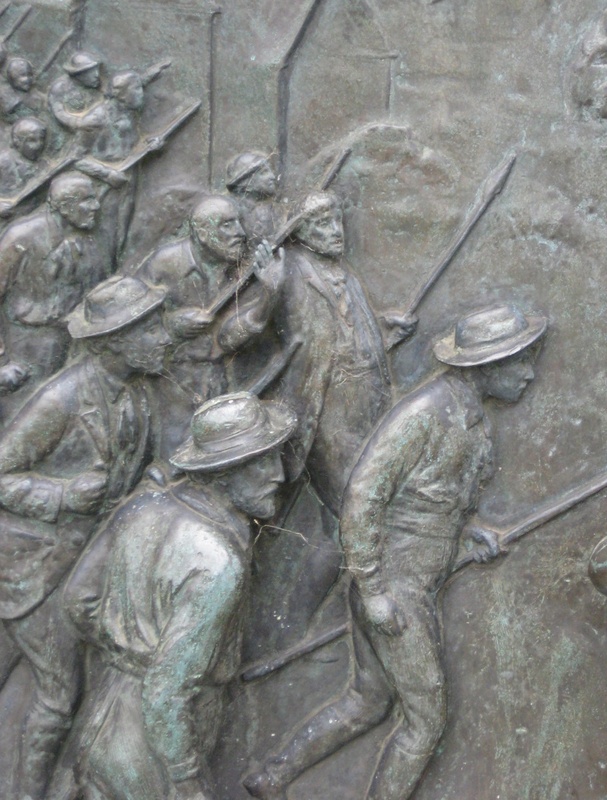 He had also been involved in a meeting of the thirteen "captains" of the rebellion when the Eureka stockade was thrown up after the march from Bakery Hill on the 1st of December 1854. John Manning had been in the thick of the rebellion. Inspector Carter had found Manning in the guardroom of the stockade (the armoury), when he led an attack on the tent. He personally arrested Manning and handed him over to Lieutenant Richards of the 40th Regiment. Faced with the problem of a Melbourne jury not wanting to find the accused guilty and with eleven more charges of High Treason to be heard, the Attorney-General asked the courts for a months stay, so that they could review the charges. Governor Charles Hotham was adamant they must stand trial, so the Attorney-General in an attempt to secure a conviction stood down the original jury panel and empanelled a new list of 178 jurors on the 19th of March 1855. This jury panel was hand picked, solid middle class men, who could be relied on to convict the Ballarat rabble that had defied Her Majesty Queen Victoria. Hotham went to bed, secure in the knowledge that the jury would do its job and convict the rest of the accused. ↑ Perth Gazette, 30 March 1855. Pikeman detail from the Peter Lalor Statue, Sturt Street, Ballarat. Courtesy Ballarat Heritage Services. This page was last edited on 28 December 2017, at 00:19.